Google and other search engines have indisputably made our lives richer and easier, which is why Googling has become a verb (Microsoft could have chosen a better name for its search service, because Binging just doesn’t sound right.) Type in a phrase, find the information you need. Simple. Fast. But what if the answer to your question doesn’t show up on the first page of search engine results? That’s where the power of social networks can help. Real people helping you in real time. I had such an experience earlier this week, when I noticed that the Calendar app on my iPhone was no longer there. I must have inadvertently deleted it. I went to iTunes and looked for it to reinstall, and couldn’t find it. I went to the iTunes store and searched for Calendar and got the opportunity to buy some other apps, but couldn’t get the one that came with my phone. So then I searched on Google to no avail, or at least not quick enough avail to provide the instant gratification to which I (and I’ll bet most of you) have become accustomed. I clicked through a few of the search results and got nothing that told me what I needed to do. So I went to Yammer. Yammer is an internal social network limited to people who share your email domain. In my case, at Mayo Clinic, it’s a network of everyone with email addresses ending in mayo.edu. Start to finish, I got the answer in two minutes! And yes, it worked perfectly. 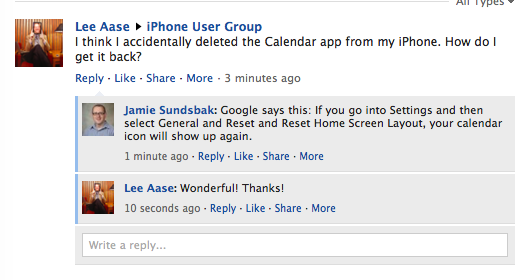 OK…so Jamie used Google to find the answer. Maybe he’s just better at phrasing his queries, and there is nothing wrong with Google. But my point still holds: a social network can connect you with people who can help you find your answers. If you’re interested in learning more, check out the Yammer curriculum section on SMUG. Yammer is fantastic and woefully underutilized. I’m recommending it more and more for work groups and as a sneaky way to get naysayers more comfy with Twitter as a tool for engagement and crowd-sourcing. Clever or what?